Aycliffe’s Wembley dream stays on track! Newton Aycliffe’s incredible season continued with a convincing 2-0 win over current Northern League champions Marske United in the fifth round of the FA Vase. Goals by Matty Moffat (pictured) and Stuart Banks gave the Newtonians victory which puts them in the last 16 of the competition, with the Wembley dream very much alive. The Blues now travel to Surrey side Camberley Town for the fifth round this Saturday (30th January). It is a sign of the strength in depth of the current squad that none of the goal scorers in the midweek 9-0 thrashing of Hartlepool FC featured in the starting line-up. Peter Dixon’s side were on the attack from the start and with just over a minute gone the home side had a free kick just outside Marske’s penalty area but Ashley Coffey’s shot flew over the he bar. Shortly after Aycliffe came close again when a Stuart Banks cross looped over keeper Robert Dean’s head and hit the base of the post. Both sides battled hard in the first half on the heavy Moore Lane pitch, staging its first game after five weeks of wet weather. 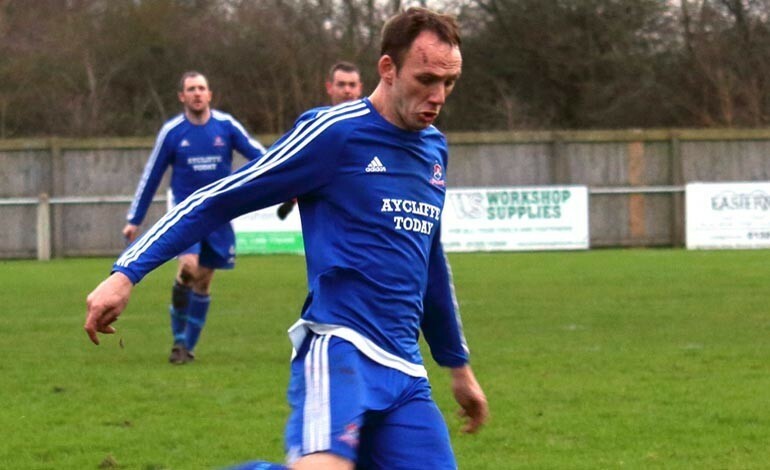 Marske’s attack included former Aycliffe player Jamie Owens who caused problems throughout. However, the home defence held firm. As has often been the case this season former Darlington played Brian Close dominated the midfield. The breakthrough for Aycliffe came on the stroke of half-time. Moffat took the ball on his chest and calmly fired a low shot into the net. The second half began as the first had finished with Moffat having a shot deflected over. After 55 minutes Stuart Banks tricked his way past the defence and played the ball to Dennis Knight who shot wide. The second goal came with quarter of an hour left to play. Once again Moffat was instrumental. This time the centre forward found himself on the right wing. Beating the Marske defender he placed a cross in the path of Banks who made no mistake with his finish. There was no way back for the visitors although they continued to press and the game finished 2-0. Aycliffe make the 550-mile roundtrip to Camberley on Saturday, and despite the long journey several loyal supporters are planning to follow the team to Surrey. To book a place on the supporters’ bus contact Yvonne Wood on 07500 866535. The next home game at Moore Lane Park is Tuesday 2 February when Aycliffe entertain Norton & Stockton Ancients (ko 7:30pm). This will be followed by a home game against Jarrow Roofing on Saturday 6 February (ko 3:00pm).